"What-if" feature helps you to analyze CPU profiling results by ignoring particular methods or focusing on particular methods only. This feature requires capturing a snapshot. It is not available in live views. CPU | Exclude Method - opens a new tab with CPU results modified such that all calls to the selected method are ignored. CPU | Exclude Subtree - opens a new tab with CPU results modified such that the selected method call is ignored. CPU | Focus on Method - opens a new tab with CPU results modified such that all methods except for the selected method are ignored. Methods, which called the selected method are shown too, but their times only include time spent in the selected method. 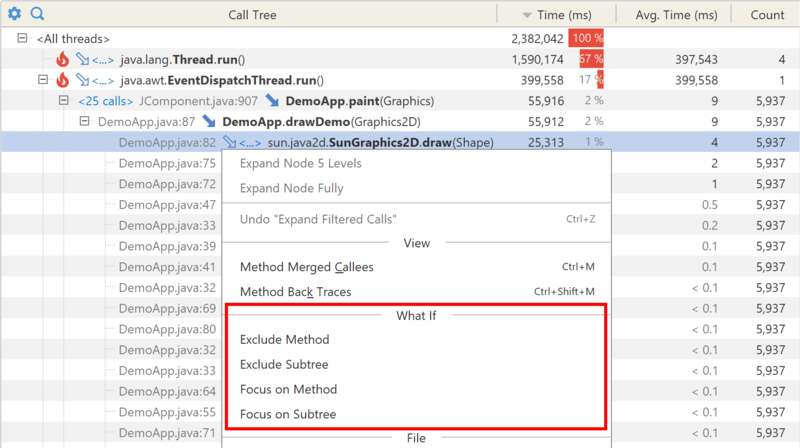 CPU | Focus on Subtree - opens a new tab with CPU results modified such that they include only selected method call. Parent method times only include time spent in the selected subtree.